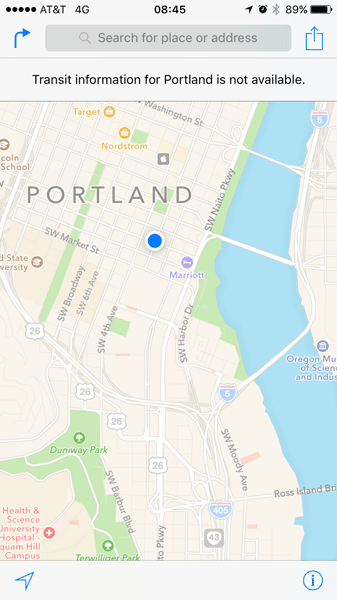 AppleInsider reader Sairam reached out on Monday to note that Portland public transit information is now available through the Apple Maps service on iOS and OS X. The expansion comes a week after Apple Maps added transit directions for Montreal, the second-largest city in Canada. And just over a month ago, Apple also debuted transit in Austin, Tex., just in time for the annual South by Southwest festival. Apple has been adding Maps transit to cities at a steady clip in recent weeks, signaling that the company isn't going to hold off and introduce them in bulk. Rollout was much slower last year, with just Boston and Sydney gaining access in October. When iOS 9 launched last year, Apple Maps transit was available in just Baltimore, Berlin, Chicago, London, Mexico City, New York City, Philadelphia, San Francisco, Toronto, Washington D.C., and 30 cities in China, including Beijing, Shanghai and Shenzhen. The reach of Apple Maps transit pales in comparison to its largest competitor, Google Maps, which is widely available across the globe. With transit, Apple Maps in iOS 9 offers routes, departure times and other relevant data for buses, trains, ferries and other forms of public transportation. Apple's Transit feature is made possible by technology gained through key acquisitions like HopStop and Embark, powered by a multitude of data sources specific to each supported location. I live in Portland and am on the latest iOS (9.3.1), the transit function says it is not available. Is this a beta version of 9.3.2 that this person is using? Works for me here in Portland, running 9.3.1 at around 4pm. Running 10.11.4 - i get the "the transit function says it is not available" message as well. Is this only a feature for IOS? How was this not low hanging fruit (no pun intended) for the original transit data rollout?